The B.C. Centre for Disease Control said the infectious person was travelling between Japan, Vancouver and Portland by air and also took a trip on a cruise ship to Alaska between July 30 and Aug. 6. 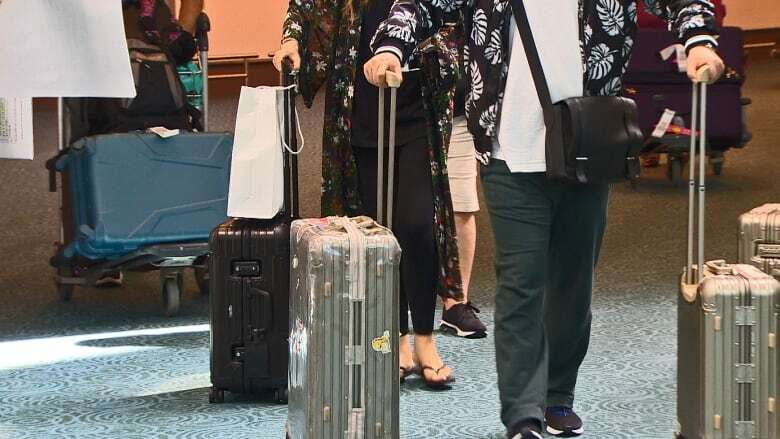 A person infected with measles passed through Vancouver International Airport twice in recent weeks, and health officials are urging travellers to check their immunization records. In a statement, the B.C. Centre for Disease Control said the infectious person was travelling between Japan, Vancouver and Portland by air and also took a trip on a cruise ship to Alaska between July 30 and Aug. 6. July 30: Air Canada flight 0004 departing from Tokyo's Narita International Airport at 4:05 p.m. and arriving at Vancouver International Airport (YVR) at 9:25 a.m.
July 30: Air Canada Jazz flight 8125 departing YVR at 1:50 p.m. and arriving at Portland International Airport (PDX) at 2:47 p.m.
Aug 6: Alaska Airlines flight 2536 departing PDX at 9:45 a.m. and arriving at YVR at 10:55 a.m. The centre noted measles is a highly infectious airborne disease, and it's asking anyone who may have been at risk to check their immunization status. The BCCDC also says care should also be taken with infants or seniors who may not have been vaccinated. Symptoms of measles include fever, cough, runny nose, red eyes and a spreading rash lasting at least three days. Symptoms appear within seven to 21 days of exposure. Anyone who suspects they have measles should contact their doctor who can arrange an examination without the risk of infecting other patients.